Not French I know, but it isn't very often that antique thermometers make the national newspapers. In 2012, this thermometer, one of only three known examples manufactured by Fahrenheit, was sold by Christie's in London for a whopping £67,000! The first viable thermometer is generally considered to have been the "Florentine termometer" invented under the patronage of Ferdinand of Tuscany in 1653. This was an alcohol thermometer, with sealed tube and bowl, usually calibrated using 50 divisions. The Florentine Accademia del Cimento distributed a number of such instruments around Europe and created a short-lived network of observers. In May 1658 the very first thermometer to reach France was sent to the astronomer Ismaël Boulliau from Warsaw by his correspondent Pierre Desnoyers who was secretary to the Queen of Poland. Boulliau's manuscript observations for 1658-60, conserved in the collection of the Paris Observatory, have been utilised by Daniel Rousseau in a paper of 2013 to reconstruct average temperatures for the period 1658-75. La Hire began his observations in 1669, again using a "Florentine" thermometer, this time constructed by the Parisian glass-blower Hubin. Delisle in 1749 made comparative measurements with this very instrument and described it in detail: filled with coloured esprit de vin, hermetically sealed, it had a bowl of 5 centimetres in diameter and a substantial tube of 1.3 metres in length. La Hire sited it in the unfinished east tower of the Royal Observatory which was open to the air but shaded from the sun. It remained in the Observatory for almost a century - comparative reading were taken at various times, notably in 1732 and 1754 using Réaumur thermometers. In 1776 it was no longer to be found and assumed to be broken. 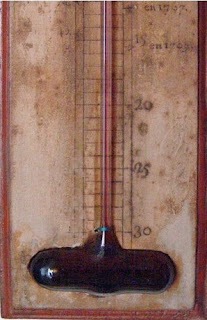 A second thermometer belonging to La Hire which was in the possession of the instrument maker Mossy in the 1780s may be tentatively identified with one on display in 1992 in an office of the Academy of Sciences (see Legrand & Le Goff, p.265). The thermometers of Morin are known only by inference. It can be deduced from his series of measurements that he used three different instruments in the course of his observations, adapting the scales so that zero was the mid-point. Although interest in meteorological observation was more marked by the early 18th century, thermometers were still few and far between. Few of Kanold's observers had a thermometer and there were none at all in the American colonies prior to 1715. According to the abbé Nollet, measurements were "vague and uncertain" since instruments had no fixed starting point and varying scales. Scientists sought ways of improving the situation. In 1717 Daniel Fahrenheit built his famous mercury thermometer with 32° for freezing point of water and 96° for temperature of human blood. In France René-Antoine Ferchault de Réaumur reverted to an alcohol thermometer but proposed 0° for the freezing point of water and 80° for its boiling point. Like the Florentine thermometers, Réaumur's first instruments were enormous (1.6 m in length). The abbé Nollet, who directed Réaumur's laboratory from 1733, subsequently improved the design by refining the calibrations and reducing the length of the tube. According to Louis Cotte, writing in 1765, the Réaumur's instrument represented the first crucial step towards standardisation: "one can build such thermometers, that function comparably, anywhere and any time". Louis Cotte; Réaumur thermometers, at the centre: "the great thermometer as Réaumur first built it"
Louis Cotte, Traité de météorologie (1774); Livre second: "Des Instruments météorologiques"
Duhamel's château de Denainvilliers claims to have the oldest surviving thermometer in France. The château, which is now open to the public, preserves Duhamel's workshop and, in the adjacent bathroom, where he conducted his meteological readings, his barometer and Réaumur thermometer. Sadly, there is no photograph to be had. In the winter of 1776 Louis XVI inquired whether it was as cold as it had been in the great frost of 1709. The lowest temperature of 1709 had been marked on La Hire's thermometer but this was no longer extant. However his scale had been compared in 1732 with a thermometer of Réaumur which still existed. There was much dispute over the figures, but finally Lavoisier concluded that the winter of 1709 was colder "by 20 degrees than the winter of 1776"